My relationship with Coventry Council of Disabled People was never an easy one. It rose to dominate my life and become a major obsession, responsible both for a sense of purpose and for pain. At times it even rose above my concern for my mother and led to conflict with her. Although she was equally dedicated to the organisation, and without her, I would have had no involvement in it, she never let it get in the way of her enjoyment of life, and kept it in proportion, although ultimately both our social lives would revolve around this and nothing else. I believed in it passionately for her sake to begin with, because I wanted a better life for people who have to use wheelchairs and put up with the inequalities of public transport, but it soon progressed beyond this as my understanding of disability and disabled people grew. It then became both an opportunity for me to learn new skills and for me to find an outlet for my creativity in the newsletter which I fought hard to have the right to edit, and then to keep going until recent time, when lack of funding has stopped this. My first involvement in the organisation was a secretary. Although this might seem a strange role for a dyslexic, my dedication won out over the inherent organisational difficulties of this task, and quite early on, I found computer help and support, initially from the Lanchester Polytechnic Race Relations Unit, who taught me how to use computers and lent the Disabled Council the use of their machines. 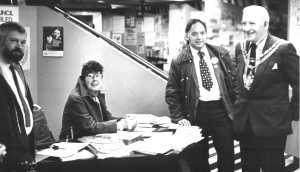 My main role at this time was publicity, writing out to other organisations and newspapers introducing the organisation, keeping tracks on new groups and working closely with the chair to fix agendas for meetings. Alas during meetings I was not always in best control of my temperament, and were it not for the support of my mother I do not think I would have lasted long. My passion would often get the better of me, and the truth is I really have no idea of the niceties of going through the chair and not interrupting people when they speak. As secretary I could keep some control because I could not get so involved as not to be able to take minutes. It was a battle of wills sometimes, and I had to fight hard both to show that I was capable of doing a newsletter and to show the need for it, but in 1984 "Trunk Calls" was born, and I was able to draw on the skills and knowledge inherited from the University Paper as well as my growing knowledge of disability topics, and a writing style that was blunt and to the point, not mincing my words but telling it like it is. To my surprise this grew popular as there are a lot of people who like to see the authorities get a rough ride in print. Over time I grew closer and more involved in another organisation, who were responsible for printing the paper. I learnt even more skills of graphics and layout, from this group who also ran community arts projects and campaigns which were close to my heart. In the end when this organisation folded, I inherited their photographic library, most of which I donated to the City Archivist, keeping only what the City did not want. When my mother took over the chair of the Council for Disabled, I continued as editor of "Trunk Calls". The organisation never had a secretary as dedicated as me thereafter, going through numerous rapid changes of personnel in the voluntary position. 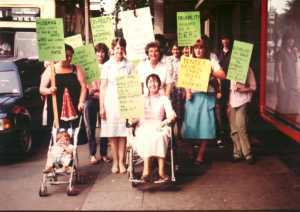 However as my mothers carer, I was also in effect her personal secretary which allowed her to make up for the shortcomings of any volunteers and run a tight ship as far as the organisation was concerned. She had a natural gift of public relations such as no salesman or graduate of business school could ever achieve, and she had a personality to go with it. With my support she was able to grow the organisation into something with a reputation beyond Coventry and get us involved in National groups like RADAR, which she went on to represent as well. I cannot begin to do my mother justice for all the things she was involved in, you would have to see her CV, (on her tribute site) to see the full extent which truly puts me in the shade. Nonetheless Trunk Calls was an important part as well, and people who met us did not realise that I could be the same person who edited and produced this newsletter, and thus in a way began the dichotomy of my character, there being the I who was fluent in print and the I who was lost for words, confused and combative in the flesh, The social incompetent, who you would not want to take to a polite dinner party as I had no idea of the niceties of conversation, nor what to do with the cutlery, who would bore you to death with the endless pursuit of my one track obsession, which was of course the Council of Disabled People and Disability Rights. Nobody was ever allowed to forget that. All the time with Coventry Council of Disabled People I was learning new skills, going on courses available to the voluntary sector. 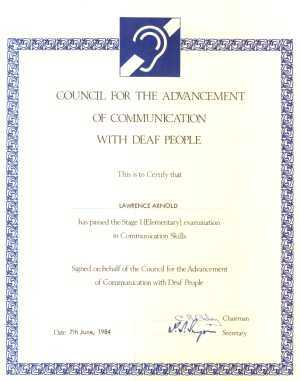 Since none of these courses were academic or exam oriented, there was none of the pressure that is put on you in college courses, though I much regret that I only gained one recognised qualification during this time, that being in communication with deaf people. This was a very valuable course as I learnt about myself at the same time, and discovered another alternative to spoken communication. It came about out of a desire to make our services more accessible to different groups of disabled people. I was one of a pioneer group in Coventry who did what is now becoming commonplace, in learning the rudiments of British Sign Language and total communication. Unfortunately being a pioneer group it was under resourced and I could not progress it any further than the first stage. Nonetheless it was a valuable experience. Being dyslexic does not necessarily help with learning signs particularly as I am badly confused over left and right, which meant that certain signs which are usually made with one particular hand first were made by me in a way that could be confusing to deaf people who do not expect you to switch hands in the middle of conversation. The signing equivalent of mirror writing, which I also do on occasion. The other difficulty was in not being able to understand other peoples signs and facial gesture particularly easily. I did not know at the time that my learning disability renders this difficult as well, I tried anyway and the certificate is quite an achievement under the circumstances. Midi Acknowledgement - Praetorius - gavottes from terpsichore, Internet Renaissance Band modified.